Flame Tree Press, 9781787581456, 256pp. Eight hundred years ago, the Zhen Empire discovered a broken human colony ship drifting in the fringes of their space. With only a third of the original colonists left alive in their cryo-pods, and the ship's computers damaged beyond repair, there was no way to know where the humans were from. The Zhen gave them a place to live and folded them into their Empire as a client state. Humans are safe. They're secure. But it hasn't been easy. Not all Zhen were eager to welcome another species into their Empire, and humans have faced persecution. For hundreds of years, human languages and history were outlawed subjects, as the Zhen tried to mold humans into their image. Earth and the cultures it nourished for millennia are forgotten, little more than legends. One of the first humans to be allowed to serve in the Zhen military, Tajen Hunt became a war hero at the Battle of Elkari, the only human to be named an official Hero of the Empire. He was given command of a task force, and sent to do the Empire's bidding in their war with the enigmatic Tabrans. But when he failed in a crucial mission, causing the deaths of millions of people, he resigned in disgrace and faded into life on the fringes as a lone independent pilot. When Tajen discovers his brother, Daav, has been killed by agents of the Empire, he, his niece, and their newly-hired crew set out to finish his brother's quest: to find Earth, the legendary homeworld of humanity. Along the way, Tajen finds he's got a new family, including the dashing ex-soldier Liam Kincaid. Flying this close to disaster and death is probably the worst time for Tajen to start caring about people again, but he'll need them--because what they find on Earth will shatter the peaceful coexistence of humanity and the Zhen Empire, and start a war that could be the end of the human race. 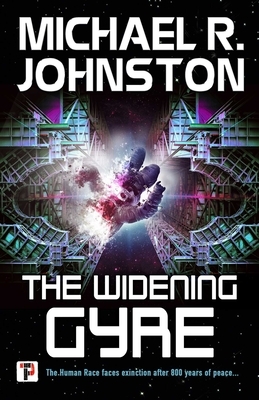 The Widening Gyre is a story about putting yourself back together, finding a family, and finding something worth fighting for. FLAME TREE PRESS is the new fiction imprint of Flame Tree Publishing. Launched in 2018 the list brings together brilliant new authors and the more established; the award winners, and exciting, original voices. Born in the San Francisco bay area and raised in Napa, California, Michael R. Johnston grew up steeped in everything Science Fiction and Fantasy from Asimov to Zelazny, as well as endless terrible SF TV shows he still has a slightly embarrassed fondness for. Faced with the choice between moving back in with his parents and continuing school, or paying his rent, he took "a year" off from college. He spent time as a court process server, a retail sales associate, a sandwich maker, and a data entry tech, before finding himself in a management role. A decade later, burnt out from his job in political research and facing 30, he decided he'd had enough and returned to college, graduating with honors from California State University, Sacramento. In fall 2006, he became a high school English teacher, a job he likens to herding a swarm of angry bees. It's the best job he's ever had. In 2013, he attended the 17th Viable Paradise Science Fiction Writing Workshop. The experience of having his story critiqued by other writers, some of them professionals he'd been reading for years, helped him realize he could write professionally, and introduced him to some of his best friends. He currently lives in Sacramento, California, with his wife and daughter, surrounded by a circle of incredibly geeky and amazing people. When he's not writing or teaching, he spends time with his family, plays video games and tabletop RPGs, and reads. He blogs at MJohnstonBooks.com, and can be found on Twitter @MREJohnston.